Today I'm gonna write another quick short review on one of my favorite makeup brands. 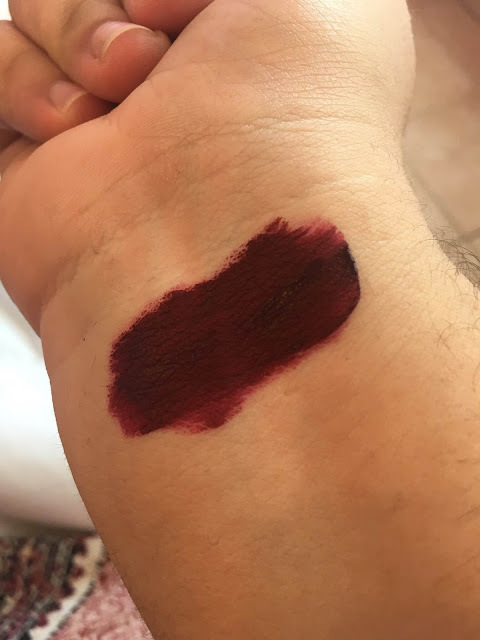 About a week ago I order Lime Crime blood moon limited edition since hey we're in Autumn I love all kind of shade of red and I need a dark red for my collection any skipping all the process. The lipstick arrived pretty fast and I was excited to try it on. I'm completely in love with this color shade it's a very deep red. I think it's one the darkest red lipstick that I have in my collection in general (?) it dries quite quickly just like other Lime Crime Velvetines. Unfortunately the lipstick is sooooo flaky like it doesn't even last for five minutes I tried to use different method but nothing work on me sadly the color is so pretty but the quality is pretty bad. I'm 10000000% disappointed over this product especially from one of my favorite makeup brand. Thankfully I contacted Lime Crime Customer services and the issue got resolved. I'm assuming that they added another ingredient and added too much concentration. I'm still not quite sure but I'm still planning on buying another product from them definitely not blood moon but another velvetine's. Si no puedes bregar con críticas, quitate del entertainment industry of any kind.